Animal Stak by Universal Nutritionis designed to work naturally with your body to enhance the function of "Test" and growth hormone. As a serious lifter, you want to get bigger and stronger. Who doesn't? So you look for every advantage. You train balls out and you eat big. But you want more. Optimizing your body's levels of naturally-occurring muscle building hormones - hormones like "Test" and growth hormone (GH) - can make a huge difference when it comes to making the gains you want. finally, you'd want to make sure that your ratios of “free” "Test" to “total” "Test" are advantageous. By addressing all three issues, you could tap into your body's true potential. We engineered Animal Stak 2 to address all three aspects of hormone management mentioned above, making it a complete natural “test” pack. Universal Animal Stak 2 contains ingredients to help prevent estrogen and DHT conversion, a natural process. It also includes nutrients that can help increase serum "Test" levels. Of the three though, the most important element is probably the ratios of “free” to “total” "Test". The average male has anywhere between 300-1000 ng/dl of “total” "Test" in his body. Problem is, total "Test" doesn't indicate how much "Test" is actually usable by the body. In other words, even if you have high total "Test" levels, you can't take advantage of it. This is because the vast majority of "Test" is “bound” up in your body. That's why you have to look at “free” "Test". Free "Test" is the form of "Test" that exerts the muscle building effects strength athletes are after; it's the stuff that gives you results. While valuable, the problem with free "Test" is that it comes in very small quantities. In fact, only a tiny fraction of total "Test" comes in the free, or active form (less than 2%). Think about it this way: even though you might have 700 ng/dl of total "Test", only 14 ng/dl or less as free "Test" might be able to enter cells in order to produce results by binding to androgen receptors. So while you want to increase total "Test", you especially want to increase free "Test". 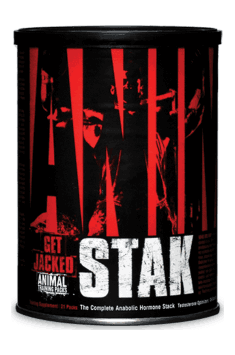 So if you're looking for an alternate route to get the most out of muscle building hormones, and you got everything else in order, then it's time to give Animal Stak a shot. Whether you have low, moderate, or high "Test" levels, Animal Stak can help you tap into that 98% of "Test" in your body that is unusable so that you can reach your potential. One portion (1 sachet) 30 minutes before training. One portion (1 sachet) before breakfast. Apart from standard application, it may also work well as a post cycle therapy supplementation after using doping. In both cases, the above mentioned scheme should be beneficial. It is recommended to use for at least a month. Natural stimulator of growth hormone. It contains arginine, ornithine and lysine. Increases strength.